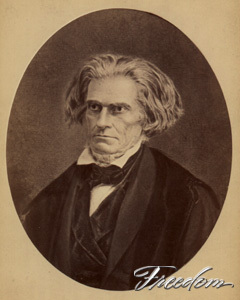 John C. Calhoun was a political leader and the preeminent spokesperson for the states-rights doctrine and slavery in the South. During his long and accomplished career he served as congressman, secretary of war, senator, vice president, and secretary of state. He was vice president under John Quincy Adams and Andrew Jackson. It was in his last address to the Senate, made shortly before his death in 1850, that he warned of the disruption of the Union unless slavery was protected in the South. This is a photograph of a painting on a cabinet card published by Mathew Brady.